Do Canadian Colleges Employ Sweatshops? Home/Blog/Do Canadian Colleges Employ Sweatshops? I had a friend back when I was in college who worked at a paid internship with Johnson and Johnson which eventually led to a full-time position. He’s one of the rare cases of anyone who interned for a company that evolved into a full-time position. Now that I’m a lot older, I look back and wish I had participated in an internship program since it landed some of my friends positions at reputable companies and gained them valuable work experience but sadly, not all internships end like fairy tales. Since I wasn’t an intern I chose a different route which in retrospect I’m also happy with. I utilized my skills as an entrepreneur and began building websites for startups and small businesses straight out of college. Since I wasn’t very business savvy it wasn’t a very lucrative start to my career but I learned quite a bit to meet my clients demands. These days I question whether Canadian colleges are aware that they’re interns end up simply being duped into working for free in tech sweat shops for small businesses with no capital to even pay a decent and well deserved hourly wage and no intention to hire. Why do I know this? Because after my success as an affiliate marketer crashed I was forced to take a job at a small marketing company whose facade of being a global marketing company actually employed an army of interns throughout the year which at times made up half the staff. Interns were typically expected to perform the most menial tasks that were a step above sweeping floors. I would sometimes hear full-time staff complain about how the interns weren’t performing well, berating them or referring to them as lazy. But how passionate would anybody be knowing that they were driving to a job, working a full day with no pay on the off chance of obtaining a full-time position which was realistically slim to none. I remember seeing a picture on my brothers bedroom wall that had a picture of a mansion on a cliff facing the water with lavish sports cars parked on the driveway. 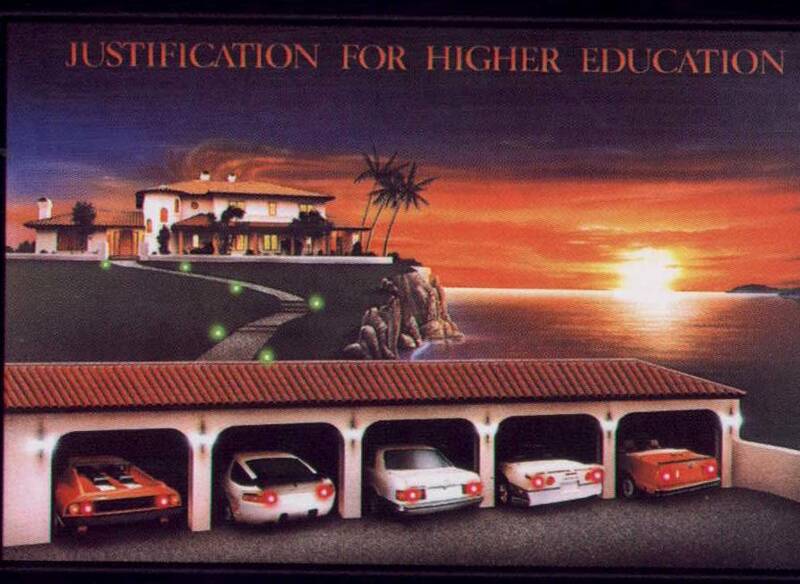 It said a the top “Justification for Higher Education”. Universities and colleges in Canada offer great programs which provide students a wealth of knowledge in order to prepare themselves for the workplace. After spending tens of thousand’s of dollars and hundreds of hours studying, they would have obtained the knowledge that would reward them more than a burger flipper or barista at Starbucks. Yet known colleges across Ontario unknowingly “pimp” students out to sweat shops year after year. Don’t they notice the pattern that their interns rarely, if ever result in full-time positions? From my own experience of being a student leaving college the last thing I would’ve wanted after countless sleepless nights, learning the latest trends and technologies, building myself and having almost an empty bank account – was to work for free. I also cringe when I see job postings for “volunteers” from organizations that clearly turn a healthy profit and can afford to pay but that is a separate issue. It almost all reminds me of a type of modern day slavery where businesses profit from unpaid workers. I’m very passionate about this because I hate seeing people get ripped off or taken advantage of. I believe everyone deserves to be paid fairly for their hard work and contribution. I’m sure it impacts the businesses success in some way. Whether it’s running their social media, blogging, research or grabbing coffee. I’m sure profit sharing is possible at the very least to provide some reward for hard work and effort. I not only sympathize with the interns but also dislike the free labour advantage that it brings to the table for larger businesses. Unpaid internships need to be closely regulated by colleges and universities across Canada.